In 2017 MLA honored two outstanding elected officials with a special MLA Lifetime Achievement Award. This recognition is for leadership in promoting libraries and supporting legislation or amendments that advance our legislative goals. The Michigan Library Association Board of Directors has awarded Sen. Jack Brandenburg (R-Harrison Township) and Sen. Goeff Hansen (R-Hart) the MLA Lifetime Achievement Award in recognition of outstanding leadership promoting libraries and their important place in our communities. 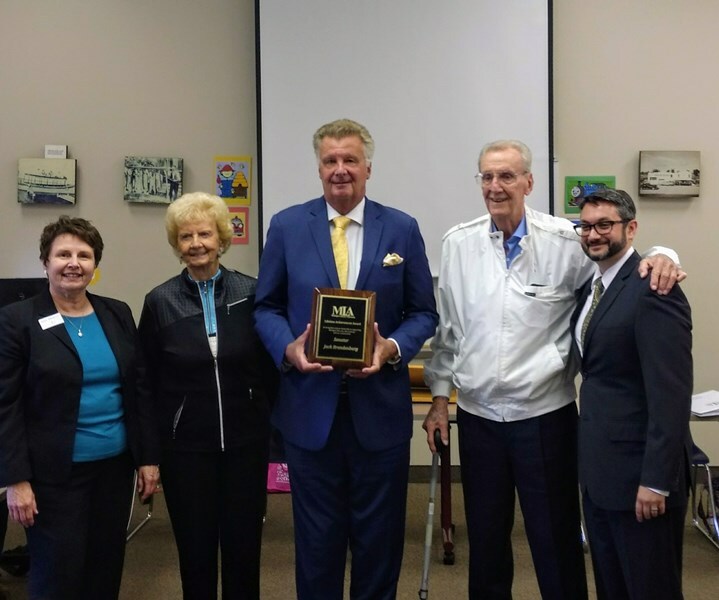 LANSING – Michigan Library Association (MLA) has recognized Senator Jack Brandenburg (R-Harrison Township) with its first ever Lifetime Achievement Award for his leadership in promoting libraries and supporting legislation and initiatives advancing the library community’s goals. Many Michigan residents depend on libraries for resources including Internet access to government web sites, job search and applications, early childhood reading classes, after school programs and small business information and assistance. Sen. Brandenburg received his award at the Michigan Library Association’s Board of Directors meeting on September 8 at the Chesterfield Township Library.